Skyteam carriers Air France-KLM offer competitive solution from main airports in the United Kingdom to Rio de Janeiro. Flights with (usually) one short layover in Paris or Amsterdam are available from £357 incl. all taxes, onboard meals and hand bag. Note that there is no checked luggage in base fare only available for extra fee..Look for flights departing from Manchester, Inverness, London, Birmingham, Edinburgh, Glasgow, Newcastle or Leeds.. If interested in this solution with Air France-KLM you will find the cheapest flights when departing from the UK to Rio de Janeiro in May and June 2019 or February and March 2020. Min stay 6 days or over weekend. Max stay 3 months. No free stopover available. No bag in hold in base fare. Fare class (Feeder / Intercontinental leg is “L / G“. Air France promo sale is running till 1st of April or until sold out..
You can book your accommodation in Rio de Janeiro via Hotels.com or Booking.com. Also you can further discount your hotel when using one of following promo codes. 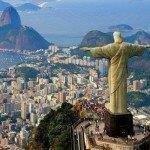 Booking sample of cheap return flights from the UK to Rio de Janeiro from £357! In this case you would fly from Manchester to this Brazilian city on 27th of May. Your return flight from South America back to the United Kingdom would be on 9th of June 2019.